Summary: Just prior to the start of World War II, Dr. Melcher (Bela Lugosi), a world-famous plastic surgeon, is brought in by Japan’s Black Dragon Society as part of a secret plan. Dr. Melcher operates on six Black Dragon Society operatives and transforms them into exact duplicates of six high-ranking American businessmen who are replaced by these look-alikes. 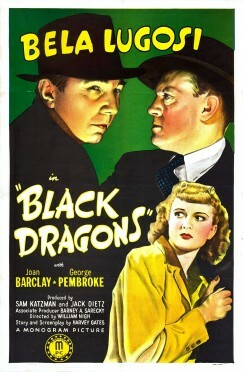 With their operatives in place, the Black Dragon Society’s plan to sabotage the American war effort appears to be set, but the FBI Chief and an agent begin to piece together the clues that hopefully will uncover this sinister plot. Despite this movie being twenty years older than yesterday’s, the audio quality is actually better. I let this one play in the background while doing work for my sister’s baby shower, so I don’t have a ton to say about it besides the premise is satisfyingly creepy. I’m not down with people getting surgically transformed into other people. Bela Lugosi is always a treat, and some of the action even takes place in Pittsburgh, which is cool. I always get a kick out of Pittsburgh mentions.